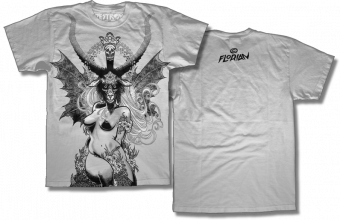 The Art of Florian Bertmer: New shirt online from Shirts & Destroy! 3 color full bleed print on Shirts & Destroy 100% ORGANIC cotton T-shirts. I just bought one this and another of T.B.I!!! Hi Florian, i'm the artdirector of PassengerPress (www.passengerpress.com). Please, send me an email to m.andreoletti@gmail.com. Thanks a ton! Sorry, wrong adress! the right one is ma.andreoletti@gmail.com. Thanks! Did you draw a different Baphomet for the Doomriders? If so, do you have prints of that for sale? It's really stupid how shirts and destroy puts this on the 3rd page. I didn't even see it when I was browsing around their new site. They should put all products in one page for usability! Oder habe ich ne andere Möglichkeit nicht mitbekommen? tbi rules & thanks for the hug! @Jarrod:thanks for the heads up about the bug.they fixed it.